If the reported settlement of $20 billion is all it takes to get the banks out of their foreclosure fraud liability, we should see a pop in the financials. I’ve been watching a bullish Bat pattern evolve in XLF. While I’m very bearish on the financials (and the market in general), a settlement could provide a short-term boost that leads the XLF and the overall market higher over the next few days. The pattern targets an upside of 16.55, but a return to the upper end of the channel is likely all we’ll see. One note of caution for traders: this pattern’s CD leg is currently approaching a 2.00 extension of the BC (1.94 at today’s low.) 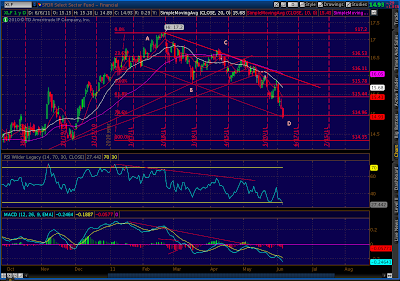 Bats can also extend to 2.24 or 2.618, which would result in continued downside to 14.6 or 14.24 respectively. 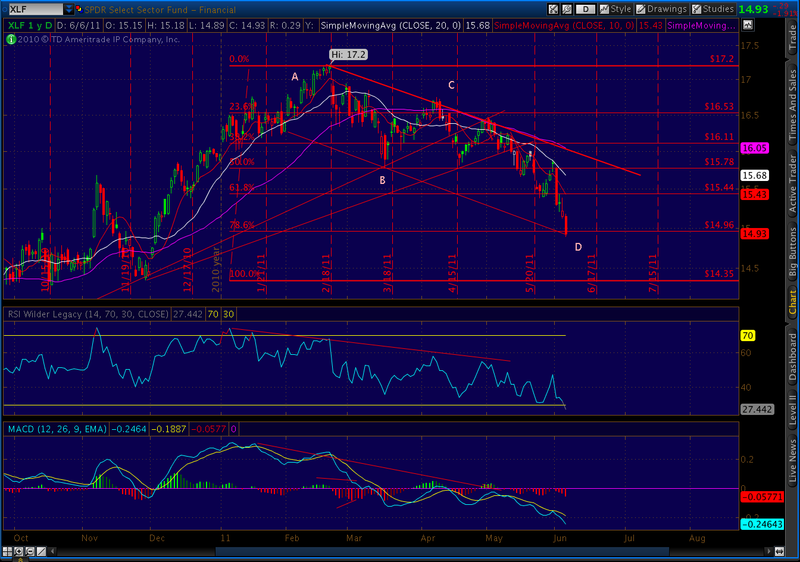 That would drop XLF out of the channel, which is entirely possible. Experienced harmonics traders look for a confirmed move in the anticipated direction before placing trades, and place stops to limit the fallout from the 30% failure rate. I suppose it depends on what kind of trader someone is. If you held the June 15 calls and you're up 20%, you're on to the next trade. If you're looking for the bigger move back to the top of the channel, and want to "set it and forget it", maybe a gap up in sync with the overall market isn't enough for you. I am unbelievably bearish on this sector. It's always one newswire or lawsuit away from Armageddon. I just see it as a chance to take advantage of an oversold condition that's sorely in search of a breather. Does a 1% gap up qualify?